I C Electrical's Installations department has been an integral part of the company since its conception in 1986. Our range of electrical site services range from fibre optic and bus networks, through to 415 vac up to and including 11 kvac. IC Electrical proposed an ASi based system for Gas valve blocks and a Flex I/O System (locally Installed) for all other valve blocks, valves and instruments. The innovative cost savings presented were estimated at circa £50k. IC Electrical Ltd are an electrical engineering contractor based centrally in the UK. Capable of providing a complete in house electrical engineering solution incorporating the design, build and installation of Control panels, HV and LV electrical systems, Communication and Automation systems along with small power and lighting installations. I.C.Electrical Limited became part of VEO Group in late 2017 and is 65% owned by the Finnish mother company VEO. Committed to working together with our clients from cost analysis and budget stage through to project completion. Tenders are prepared and delivered, such that our clients are completely assured of the solution we offer. Our aim is for you to have complete confidence in our abilities to deliver your project on time and in budget. Experienced in carrying out electrical installations throughout Europe, Africa and Scandanavia our management team are specialists in process and packaging applications with many projects worth of technical knowledge to call upon. In addition, we have developed a network of suppliers and service providers to enable us to facilitate your project whether it be in the UK or further afield. I.C. Electrical manufacture Electrical and Pneumatic Control panels in our workshops - these panels can be entirely bespoke. We have extensive experience in carrying out electrical installations in process and packaging applications within the utilities and process industry. These include CIP systems, brewing, bottling, canning, kegging, distilling, beverage industry, dairy industry, power generation, fruit processing and milling, pharmaceutical industry, beauty product industry, bio-ethanol plants, brick and tile plants, biomass plants, water and sewerage plants. IC Electrical has the specialist expertise and technical knowledge to ensure we are a reliable partner on any project from design, installation and commissioning. Working closely with our supply chain partners we ensure that the design of a project is tailored to our clients' needs, offering an achievable balance between capital and operation costs. I.C. 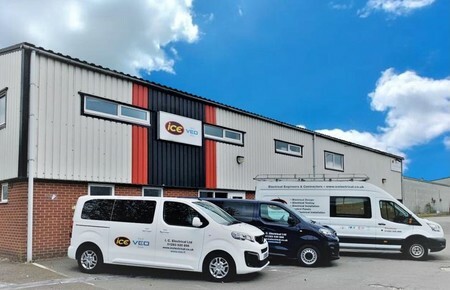 Electrical Ltd is based in Burton upon Trent, Stafford, and was founded in 1986. The company has been recently awarded the ISO 9001:2008 BSI Accreditation and has extensive experience in carrying out electrical installations in process and packaging applications within the utilities and process industry. These include CIP systems, brewing, bottling, canning, kegging, distilling, beverage industry, dairy industry, power generation, fruit processing and milling, pharmaceutical industry, beauty product industry, bio-ethanol plants, brick and tile plants, biomass plants, water and sewerage plants.